The TsunamiReady® program began in 2001 to promote tsunami hazard preparedness and improve public safety before, during, and after tsunami emergencies. 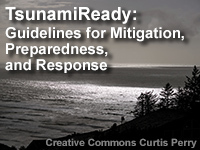 In 2015, the National Weather Service updated the TsunamiReady Guidelines based directly on emergency management principles and with input from the social sciences. This training provides an overview of the 2015 guidelines, which are focused on mitigation, preparedness, and response. The training will equip community officials and others interested in becoming TsunamiReady with strategies for streamlining their implementation of the guidelines. Numerous examples of efforts taken within communities are illustrated, as are tips for garnering support and fitting the activities with existing all-hazards planning. The lesson is very interesting, but since I'm not from USA and my area is not affected directly by Tsunami, I don't think I would take the lesson if it was not part of the course that I want to do. However the lesson gave me some ideas for mitigation risk on landslide. The pre-exam definitely helps focus attention on critical parts. I thought this module contained important information about being tsunami ready, and all coastal areas should be aware of the material presented in this lesson. the class is good, but be warned that the material is confuseing and the test is as well, I read the lesson three times and still had issues with the quiz, and still working on to pass it. December 2017: Lesson links were updated to go directly to the new TsunamiReady website and materials located at https://www.weather.gov/tsunamiready/.